While many restaurants focus on the dinner crowd and the more complex food that goes along with it, putting effort into lunchtime offerings can greatly benefit the appeal of your restaurant. Lunch offerings can include smaller versions of dinner entrees, specialty soups or salads and unique sandwiches. Sandwiches and the similarly made wraps are by far the most versatile food item most people can think of. Comedian Bill Cosby has a joke where he claims that Americans can eat anything at all as long as it's first placed between two slices of bread. A piece of restaurant equipment that improves the quality of your sandwiches can only be a plus. A panini grill is just such an item, and utilizing it to it's full potential can make your restaurant a lunch hot spot as well as a dinner destination. A panini is basically a hot sandwich, and you could conceivably make one out of any sandwich, from outlandish to mundane. Baked chicken and chunks of mozzarella with roasted peppers can be coated with pesto sauce, placed between two halves of a baguette and toasted in a panini grill. The resulting pesto chicken panini might be your best seller. Take slices of seasoned lamb, lettuce and tzatziki sauce, wrap them together in a tortilla and grill them to make a crispy gyro that is sure to please. 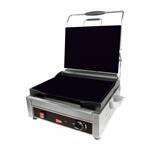 There are other options for your panini grill as well. Make fancy grilled cheeses with different breads and cheese, while also adding spices or meats such as bacon to add more flavor to the sandwich. Saute chicken with onions, tomatoes, peppers and spicy seasonings, lay the mixture on a buttered tortilla, cover with cheese and put another tortilla on top. Press the item in a panini grill for a quick and easy quesadilla. For large parties, use the advantage of a grill on top and bottom to quickly sear off both sides of a steak or burger to improve cooking time. Use the heat that comes off the top grill as an effective cheese melter to save space when melting the cheese on top of an open-faced sandwich or a soup bowl. 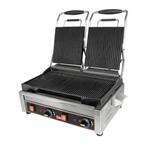 Whatever you might use a panini grill for, there are many opportunities to explore. This item would make a fine addition to any restaurant kitchen.